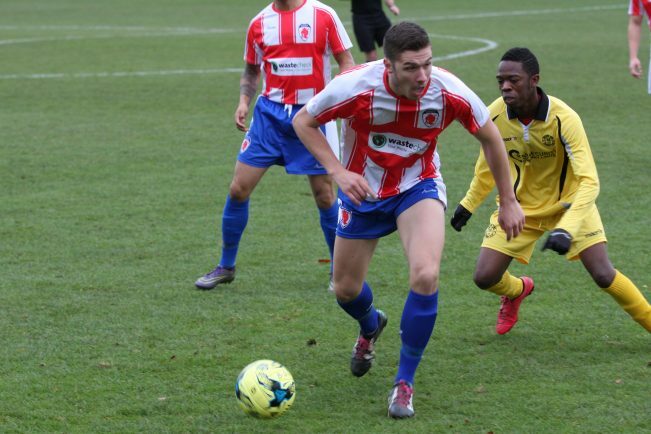 ROBBIE BUNN’s second half strike proved to be the difference as Midland League Division One leaders Bromsgrove Sporting secured a 1-0 victory over title rivals Leicester Road. After a goalless first 45 minutes, the game came to life just two minutes after the interval as Bunn beautifully volleyed home Aaron Roberts’ cross to give the hosts a deserved lead. Sporting should have been 2-0 up after 61 minutes after Road keeper Will Highland brought down Jason Cowley in the area but Ahmed Ali saw his penalty down the middle of the goal well saved. A number of goal-line clearances kept the score down for the visitors who struggled to break down the quality central defensive partnership of Luke Edwards and Craig Jones. Manager Paul Smith made two changes to the side which beat AFC Hinckley 2-1 last week as Daniel Morris and Sam Wills made way for Jones and Liam Spink and it was the Rouslers who carved out the first chance of the game as Cowley blasted over after four minutes. Despite their positive start, Sporting struggled to get into rhythm in front of a fantastic crowd of 875 at the Victoria Ground and if it weren’t for the speed of keeper Jonathan Brown to collect off his line, Road’s Tom McGlinchey could have opened the scoring just 15 minutes later after waltzing his way into the box. A glorious chance then went begging for the Rouslers after 21 minutes as Spink showed great determination and skill to skip past his marker on the right before sending in a pin-point cross to the centre of goal where Cowley could only head over. Two minutes later Matt Stenson will be wondering how he did not provide the assist for an opening goal for the visitors as his dangerous cutback across the face of the Sporting goal missed the killer touch from a number of bodies in the area. As the game progressed the Rouslers faithful became increasingly frustrated with their side’s inability to find the killer edge as Spink, Jack Wilson and Luke Shorthouse all saw efforts from distance fly over the bar as half-time approached. Shorthouse was particularly guilty of a further chance as he saw his toe-poked effort after being played through one-on-one well saved by Highland. Road were playing on the counter meanwhile but apart from McGlinchey’s daring run and Stenson’s dangerous cross, the visitors never really threatened the Sporting back line. And two minutes after the break, Road were ruing their lack of creativity up top as Bunn opened the scoring for the hosts. Some free-flowing football allowed Roberts to make some space for himself on the right hand side before whipping in a delivery which was met by the right boot of Bunn who guided the ball into the far corner with aplomb. Just a minute later Bunn almost claimed his and Sporting’s second goal of the afternoon after a loose ball broke to him on the edge of the area but he could only fire agonisingly wide with the outside of his boot. A fantastic save from Highland then denied Reece Hewitt’s long-range effort four minutes later but he soon turned villain after he clumsily brought down Cowley in the area. Ali stood up to take the penalty but Highland made amends for his error as a wonderful save with his feet prevented the Sporting midfielder from doubling the lead. The Somalian international then saw a header cleared off the line with 15 minutes remaining before a great block again on the line by the Road defence prevented Bunn from slotting home four minutes later. With time running out, Sporting opted to keep the ball in the corner and barring a slight defensive lapse from Wilson which almost allowed Sam Munton through on goal, they hung on to claim three points against a Road side who have now gone four consecutive away league games without a point and have Highland to thank for keeping the score down.